Nutrients that have been proven harmless in numerous human clinical studies may be declared as “unsafe” unless each manufacturer undergoes outrageously rigorous testing. For instance, manufacturers of fish oils like omega-3 supplements would need to conduct lengthy and expensive studies where animals are fed the equivalent of 240,000 milligrams of fish oil each day for a year. Keep in mind that manufacturers of vitamins and food supplements do not enjoy the high profit margins of the evil pharmaceutical industry. This will drive many manufacturers out of business and the remaining ones will have to raise prices to cover their increased costs. Dieticians have told us many times we need eleventeen portions of fruits and vegetables every day. This is fine if you live on the equator and grow your own food. What these brainless dieticians don’t realize is that those of us who live in the northern hemisphere, even with our own gardens and access to farmer’s markets part of the year, are forced to buy fruits and vegetables the rest of the year that are produced a gazillion miles away, are harvested BEFORE they are ripe and, by the time we get them, are about as nutritious as cardboard. I found a container of sliced bell peppers in my fridge that was more than a month old and they hadn’t even turned mushy yet. What’s with THAT? In any case, food supplements are just that – they supplement the nutrition that is lacking in much of the over-processed food we eat. As an aside, frozen produce is more nutritious than store-bought so-called “fresh” produce because they are ripe when harvested and flash frozen immediately. Don’t forget, steaming vegetables loses less nutrition than boiling them. a)	Inflation – government “core inflation” statistics do NOT include groceries. If you’ve been paying attention to your grocery bill you’ll know that food inflation is almost double digits contrary to what the a**holes in government tell you. b)	Savings – if you’re not a millionaire, you can save by buying stuff you’ll need in future. Look at it this way; if you put money in a saving account you earn next-to-nothing for interest. If you buy stuff now you’ll avoid paying inflated prices in future. In other words you’ll “earn” more by not buying at inflated prices than if you’d put money into a savings account. c)	Economic melt-down – Canada is one of the few countries to have avoided much of the pain (so far) experienced by the rest of the world. Europe is on the brink. The U.S. never came out of its first recession except for massive government spending and China is about to do a “hard landing”. Once the you-know-what hits the fan, everyone’s going down together. Read my Major Articles & Brief Updates for more economic details. d)	Fukushima radioactive contamination – we might, if we’re lucky have a year before fish oil and other sea-produced supplements are radioactive. Now’s the time to buy before you start glowing in the dark. e)	And now the FDA and other regulators mentioned above. Be careful and watch for “best-before dates”. Stuff on sale may be old. With oil-based products you need to be careful of these dates. Other longer-term products i.e. Calcium, Magnesium, Selenium, Phosphorous, etc. and other elemental products can still be safely consumed long after their “best-before dates”. 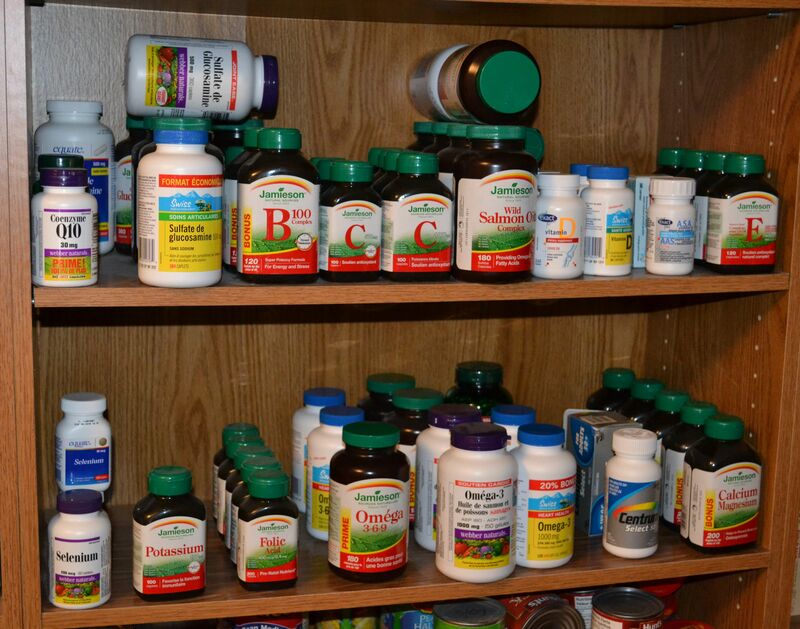 Here’s a photo of my vitamin & food supplement stockpile. I use bookshelves I bought on sale as a pantry for stockpiling food. It beats cupboards as it’s easy to see, sort, reach & replenish. For instance, it’s easy to see I need more Potassium as I have only one left. Remember to rotate; oldest at the front, newest at the back. This entry was posted in Hints and Tips and tagged Food Stockpile, food supplements, survival food stockpile, vitamins. Bookmark the permalink.